Advancement in the biomedical field, especially in medications development, comes in small increments. The many minor discoveries on the path to a new drug may not be individually newsworthy, but when those years of hard work culminate in a new treatment that changes how we practice medicine or improves public health, it is important to celebrate our success. NIDA reached such a point today, when FDA announced its approval of the NARCAN Nasal Spray, an intranasal naloxone formula that can immediately restore normal breathing in a person overdosing on prescription opioids or heroin and thus save their life. While naloxone already exists in injectable formulations, this new nasal spray will make it easier and less intimidating for families, loved ones, friends, and emergency personnel to save the lives of those struggling with addiction, giving them a second chance and hopefully encouraging them to enter into long-term addiction treatment. It can also treat accidental overdoses in pain patients. Approval of NARCAN Nasal Spray is no small accomplishment. More than 16,000 people die every year from prescription opioid overdoses; another 8,000 die from heroin overdose. Although emergency personnel in some states have been equipped with injectable naloxone for years, often they are too late on the scene to save a life. For that reason, some states have tried pilot programs distributing naloxone to opioid users and their friends and family (along with instructions for use); between 1996 and 2014, over 26,000 overdoses were reversed by non-medical personnel using naloxone. In 2013, NIDA entered into a partnership with Lightlake Therapeutics, Inc. (a partner of Adapt Pharma Limited), to create a more user-friendly formulation that could be quickly sprayed into nasal passages but have the same effects in the body as the injectable version. Translating an injectable drug formulation into a safe and effective nasal spray is fraught with scientific challenges. NIDA’s very capable team of scientists was led by Phil Skolnick, the Director of our Division of Therapeutics and Medical Consequences (DTMC). 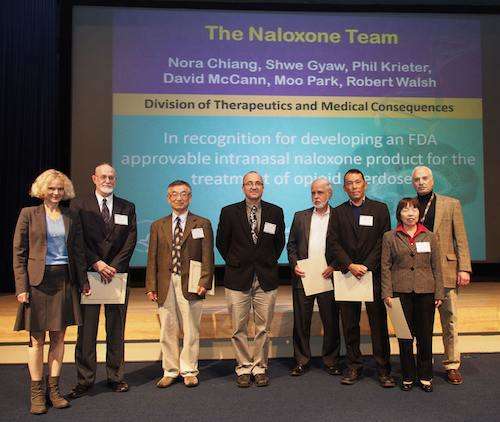 His team designed and conducted the clinical trials required to determine that our intranasal formulation delivered naloxone as quickly and as effectively as an injection, and then worked with our private sector partners to obtain FDA approval. NIDA is grateful for the opportunity to show how powerful science can be when united by the common goal of saving lives threatened by addiction. I congratulate all of the scientists who were persistent and vigilant in their pursuit of an effective scientific approach to this national crisis. For more information on NARCAN Nasal Spray, see FDA approves naloxone nasal spray to reverse opioid overdose. NIDA. "NARCAN Nasal Spray: Life-Saving Science at NIDA." National Institute on Drug Abuse, 18 Nov. 2015, https://www.drugabuse.gov/about-nida/noras-blog/2015/11/narcan-nasal-spray-life-saving-science-nida. NIDA. NARCAN Nasal Spray: Life-Saving Science at NIDA. National Institute on Drug Abuse website. https://www.drugabuse.gov/about-nida/noras-blog/2015/11/narcan-nasal-spray-life-saving-science-nida. November 18, 2015.